In July of 1893, James Hurst, a perfect English gentleman, had retrieved a treasure that would secure the financial future of his family, got scarred by a zombie and lost his virginity to Ira Russell, the mercenary he hired. After a rocky start, their mutual fascination makes James happier than ever. Despite initial worries, Ira has no trouble blending in with the aristocratic household. Even James’ young son comes to adore the new teacher of survival tactics and his maritime stories. His wife on the other hand takes a different sort of interest in Ira. Her infatuation with him is the living proof of James’ failure as a husband, but is it too late to pick up the pieces? With a political opponent watching his every move and the threat of a terrorist attack on London, James is walking a tightrope. Can he keep his family safe without giving up on his newfound happiness (and Ira’s skills in tying him up)? 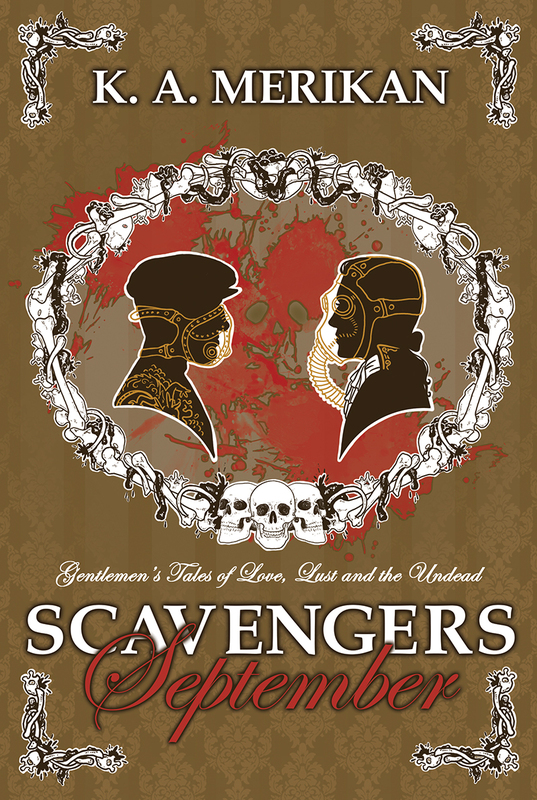 “Scavengers: September” is the third and last book in a three part series and is set in the universe of “Zombie Gentlemen”. After the fun they had with the ropes in the afternoon, James had an enormous appetite and smiled at Ira between every other bite of fish pie. He looked as happy as a well-spoilt puppy. Ira would be more than glad about that, if he didn’t feel as though he was under crossfire. Katherine’s glances were a lot more shy and discreet, but couldn’t escape Ira’s attention. He tried to be entertaining and did everything he could in order to behave politely, but he didn’t want to encourage her. He knew from experience that women, too, had sexual appetites and with Katherine not receiving any relevant attention from her husband long before he and Ira had even met, it was no wonder she was directing her attentions at someone else. Strangely enough, James and Katherine made the friendliest couple Ira had ever met. It was just the lack of any sexual tension between them that even he was feeling, which made their relationship peculiar. The lady of the house liked to laugh, read books and newspapers or go on bicycle escapades with her lady friends. Of the two, it was her who was more modern and willing to bend the rules of etiquette. “I was thinking of a themed party for Henry’s fourth birthday and it all came to me at the women’s book club today. We were reading parts of Casanova’s Diaries and we all agreed it would be a splendid idea to make it a Venetian themed party!” she exclaimed, her eyes shining with excitement. She gave Ira another glance and turned to her husband. It would be hard to say ‘no’ to a smile as cheerful as that. “You ladies read Casanova?” Ira flashed her a surprised smile. He wasn’t sure whether she was telling the truth or trying to provoke him. “Oh! I know, it’s a bit modern…” She flushed when James raised an eyebrow at her. “Dear, please don’t change the subject!” Katherine laughed like a girl much younger than she actually was. It was endearing and Ira believed a woman that youthful wouldn’t be able to get rid of suitors if she wasn’t married. Ira sighed, eating the fish pie bit by bit. He was very careful, because it’d been only a month since he has been trying to behave like a gentleman at the table, and he didn’t want to defy any rules, even if the lady of the house didn’t pay any attention to them. “Venetian party for a four year old?” James sounded more than skeptical. “Italy’s a splendid inspiration for anything!” Ira was doing his best to sound as polite as James. “Great culture and beautiful… people,” he finished with a smile, because it was mostly the masculine part of the population that was on his mind. “Oh, of course not!” Ira gave him a prolonged look. “But maybe I could give it a try if both of you insist.” He grinned, feeding himself some pie. “But you know of his work,” Katherine inquired. “Yes, my lady.” He nodded, biting his lip, unsure of what was demanded of him. “Was that in Italy?” James pushed away a loose strand of hair from his handsome face. “Well, he was Italian, but traveled a lot as far as I know. Must have been a ‘andsome man to take so many lovers.” Ira cleared his throat playing with the fork. He put it back on the plate when a maid came to clear the table so that they could have wine. James didn’t join their discussion, sipping his wine with a shadow of a smile on his lips. “And it’s so hard to travel nowadays, with so few trains and possibilities. It’s wiser to stay in the city.” James nodded at his wife. “I wouldn’t advise a trip to Europe, m’lady,” confirmed Ira with a curt nod, taking a sip from his wine glass. He sometimes felt guilty about being the only employee in the house to dine with their Lordships, but most of the servants liked him well enough and his status was similar to that of a private teacher rather than a servant. “Then again, my friends who had the chance to travel before the Plague, said that British men are the most handsome!” Katherine hid a smile behind the wine glass, but Ira didn’t have to look at her to know the comment was directed at him. It was gradually beginning to make him uncomfortable. “And what do you know of those passions, mister Russell?” James’ voice was dry. It was amusing to see him jealous about days long gone. “Do tell us!” Katherine giggled, almost finished with her wine. “A man like you sir probably knows a lot about those things!” Katherine was flushed from the alcohol. Or perhaps it was more than the alcohol. “You overestimate my capabilities, m’lady.” Ira once again shot a glance at James. “But you don’t have anything to complain about, having such a well bred and handsome husband.” He decided to compliment James. Although his lover’s lips curved into a small smile, he didn’t look up at Ira. “I’m sorry to change such an engaging subject, but speaking of Henry’s birthday made me realize that maybe it is slowly time to start searching for a proper governess. Maybe someone your friends would recommend?” He gave his wife a questioning look. “Ya don’t want to send him to one of those fancy schools?” Ira asked without thinking, before adding a hurried “m’lord”. Katherine chuckled at his slip. “It would be amazing to have him go to Eton, like I did, but that’s still a few years to go,” said James, finally looking up at Ira, with a mysterious smile. Ira bit his bottom lip, exhaling quite loudly at the vision of James bent over a teacher’s desk, with his pants lowered to reveal creamy buttocks, and a cane smacking them repeatedly to leave red welts. He imagined himself as the teacher and it brought a wide grin to his face. Maybe they could… pretend to be in this kind of situation sometime. “I’m sure.